Advertise your job or fellowship position in the SMDM newsletter and in SMDM Connect, the member resource center! Please submit along with your order form the text for your ad in a word document. As part of your order, you may also include a direct link to your website or to a PDF advertisement. Interested in advertising a service or other non-job related announcement? 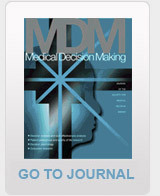 Consider MDM Journal!